When it comes to hand sewing basics, it's important to learn how to sew a straight line. Straight lines are always difficult. Drawing a straight line, cutting a straight line, and especially sewing in a straight line. With How to Sew a Straight Line by Hand, we will go over some tips, tricks, and techniques for learning how to sew straight. We are also providing a tutorial for how to sew a straight line that will help you to practice. Whether you are sewing seams or adding a border to a fabric piece, learning to sew a straight line is something that will come up frequently in sewing patterns and projects. Sewing by hand involves more patience and skill, which we will help you master with our tips. 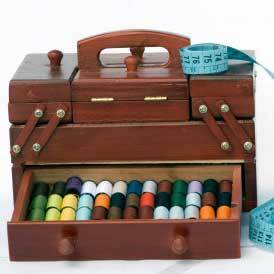 This skill is also essential for when working on embroidery or hemming a garment. It is also an important skill to teach children who are learning how to sew by hand. Even if you don't think you need to know how to sew straight just yet, learning it now will save you time later. Of course, you can bookmark or pin this for when you need to learn at a later date. Either way, if you sew, learning the patience of a straight line is invaluable. For both adults and children learning hand sewing basics, start off with lots of practice. You don't want to start with your final project if you are still learning a sewing technique. Particularly with hand sewing because it is far more time-consuming than machine sewing. “Hand sewing in a straight line is a matter of just acclimating yourself to sew that way, it takes a bit of practice. The first time I tried it I was about 10 and my aunts were trying to teach me how to piece a quilt block. My stitches were all over the place! I don't think I had the physical ability or muscle control yet. Age is one of the first prerequisites. Once you are old enough and have the necessary hand/eye coordination then practice to help yourself get used to it. The first two quilts I made I hand pieced and hand quilted every bit of them. It was a process, I didn't just wake up one day and find myself able to do it. First set of blocks I marked every single sewing line, not quilting line, sewing line. After a week or two I marked a sparsely dotted line, then just 3 dots for the start, mid point, and end. If you know exactly where to start, where you are going and can check yourself on the way you will grow used to it. The second guideline is to mark your path and decrease the markings as you go along. After that, I was able to sew straight by always knowing where I was headed and by doing multiple stitches at a time on the needle. I think you will never sew straight if you poke the needle in on the top and then stab it back up from the bottom. Move your wrist and take multiple stitches that all line up is the third idea I follow for straight hand stitching. Below, we will go through three steps for practicing sewing in a straight line. Once you have practiced each step, you will be ready to start your sewing project. There are even more advice and suggestions after that as well! Step 1: Using a ruler and a fabric pen or pencil, draw a few straight lines of stitches. Then practice stitching each of the lines with your favorite needle and thread. These lines can start as only a few inches long. As you progress, add an inch or two to the line. You can also choose to draw a solid instead of dashed straight line to work on your pacing and evenness of stitches as a branch of the first step. Because you are not copying the exact stitches drawn, this is a little bit more difficult but still allows you to follow the line that has been drawn. Repeat these processes by drawing and stitching additional lines until you feel comfortable. Step 2: Instead of drawing the exact stitches in a straight line, skip one or two stitches (whichever feel more comfortable for you) and then fill in the missing drawn stitches with your thread stitches. This will help you practice stitching straight with some guidance but less than in the first step. As you continue practicing this step, you can skip more stitches in your drawn version of the line to build up your hand sewing skills. As mentioned previously, adding length to your lines as you practice is another way to increase your skill level. Repeat this step until you feel ready for the next challenge. Step 3: With your ruler and fabric pen, mark only the beginning, middle, and end of your lines (of varying lengths). Hand stitch the line from beginning to end. Remember to move at your most comfortable pace. It is more important that the end result looks straight and clean than the time it takes to make it so. Patience is key. If you find yourself veering off the straight line, find your way back and continue sewing as straight as possible. It's ok to make mistakes! That is what practice is for. Again, continue practicing until you have stitched a few straight lines. This hand sewing tutorial is for a simple straight stitch (watch the video here). However, when sewing your project, you can choose your favorite stitch or use the stitch recommended in your pattern. "My advice would be to use a ruler and a vanishing fabric marker to draw the line, then sew over it and wait. The pen line with disappear, just like magic, in 24-48hrs. If you need faster results the marks can be removed with a damp cloth or rinsed out in cold water." You can also sew using an embroidery hoop or some sort of fabric stabilizer so that your fabric is taut as you work. Be sure you are in an area with good lighting as the details are important in hand sewing. Prepare your fabric. Draw dashed or straight lines if needed with a water soluble pen or pencil onto the fabric where needed. Knot the bottom of your thread. With your thread and needle, start from the back and pull up through the top of the fabric at the point of one stitch length in from the start of your line. Bring the needle down through the fabric at the start of your line (you are moving backward). Pull your thread through. Move the needle up through the back to the front of the fabric again, this time at one stitch amount forward on the line. Moving backward again, push the needle back down using the hole at the left (this is the first hole you made in Step 2). Repeat the process by coming back up through the back to front one stitch length ahead. Move the needle back down to the back from the front by using the hole at the end of the previous stitch. Continue this process until your line is complete. Then tie off your thread and move on to the next line. Do you have any tips for sewing straight? "You don't want to start with your final project if you are still learning a sewing technique." - Now, THAT is the advice I wish I had known before I began sewing my first project. Granted, it was for a class so a learning curve was to be expected, but it would have been nice to know I wasn't just going to come out the gate knowing how to sew in a straight line. This is such a great article, especially now that I'm thinking about trying my hand at embroidery (the pop culture patterns are too amazing to resist). Thanks! This is especially helpful for people first starting out but everyone can use a refresher sometimes. Thanks so much for a great article! I have been wanting to try out embroidery but can't master sewing in straight lines. I never thought to try marking out lines using a pencil. Great tutorial. I never was very good at precision hand sewing even though I did sew quite a bit as a youngster and tried my best. I think a lot has to do with patience as well as ability, neither of which I had at the time. I think if I had this type of practice I might be a bit better now! I have so many lovely hand embroidered pieces that my mother and grandmother made and I marvel at how even the stitching is and how precise the designs are. Such talent to create works of art!